On her first day volunteering at a local pregnancy center, Kennedy receives a call for help from a girl who's far too young to be pregnant. A girl Kennedy will risk everything to rescue ... even her own personal safety. 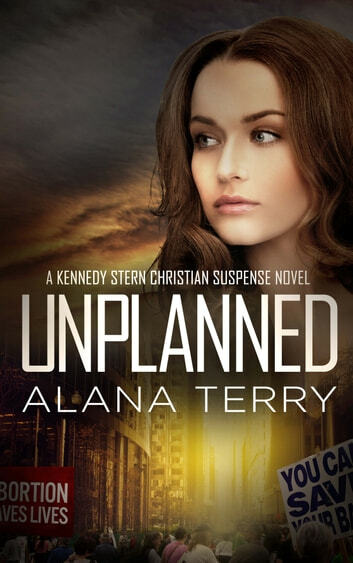 Intense, gripping Christian fiction from award-winning author Alana Terry. Book one in the bestselling Kennedy Stern Christian suspense series. Fast-paced, suspenseful, and basically impossible to put down. But be prepared to stay up late. Having read (actually listened to) and been caught up in Alana Terry's The Beloved Daughter, I was delighted to read Unplanned by the same author. I was not disappointed. Unplanned is a fascinating story that will keep readers turning the pages. With several twists and turns to the plot and likable, realistic characters, this book is a keeper. About halfway through, I was totally blindsided by what happened. It was a "wow, I certainly did not see that coming" moment! As the suspenseful and well-designed action scenes unfold Terry brings out the reality of the pro-life vs. abortion issue. Christian values and faith are key throughout the book. I am looking forward to the next in this Christian Suspense series. This is an amazing story of a young girl, Kennedy, who grew up as the daughter of Missionaries in Yanji, China, but who is now at Harvard University in the States in her first year of Med school. Kennedy has had a Christian upbringing but she has never really had her faith tested or tried. This exciting and sometimes terrifying story gives her an opportunity to be truly tried and tested in some very unexpected ways. The story is well done, the characters developed to a point where one can almost see them and you will remember these people long after you put down the book. Your heart with ache for little Jodie, you will wonder what happens to Charlie, and you will certainly want to follow Kennedy further in her life. It is a book which you will not want to put down once you start reading. Well done, Alana Terry! Kennedy Stern is a young college student that has recently returned to the United States after living in a foreign country with her parents. Her former pastor has reached out to see if Kennedy would be willing to help with some staffing needs at the pregnancy center he and his wife are opening. Kennedy reluctantly agrees to take the hotline phone home over the weekend to help out. Little did she know how that one decision would change her life forever. You'll have to read the book to find out more. 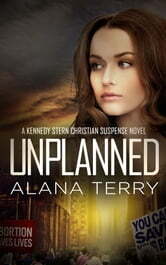 Unplanned by Alana Terry is a fast-paced novel that deals with the hot-button topic of abortion. There are 2 sides to every debate and she presents them both very well. The reader is given much food for thought. This book was so good that I couldn't put it down! I highly recommend it. I received a copy from the author and The Book Club Network. All opinions are my own. This is an amazing story of a young girl, Kennedy, who grew up as the daughter of Missionaries in Yanji, China, but who is now at Harvard University in the States in her first year of Med school. Kennedy has had a Christian upbringing but she has never really had her faith tested or tried. This exciting and sometimes terrifying story gives her an opportunity to be truly tried and tested in some very unexpected ways. The story is well done, the characters developed to a point where one can almost see them and you will remember these people long after you put down the book. Your heart will ache for little Jodie, you will wonder what happens to Charlie, and you will certainly want to follow Kennedy further in her life. It is a book which you will not want to put down once you start reading. Well done, Alana Terry!